Prior to leaving for my fellowship I saw a mention that the National Geographic Museum in Washington DC was hosting an exhibit on Indiana Jones and archaeology. Since I am creating a lesson plan on archaeology as my project for my Life Guard Teacher Fellowship here at Mount Vernon I thought I would venture into town and check it out. I had heard of the National Geographic Museum but never visited prior to today. While in DC you get accustomed to experiencing quite a few museums for free. The price of an adult ticket to visit the National Geographic Museum was $15. The ticket included entry to the Indiana Jones and the Adventure of Archaeology exhibit as well as the Monster Fish : In Search of the Last River Giants exhibit. 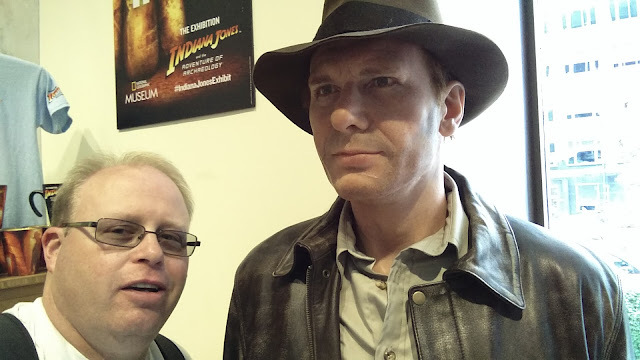 I visited the Indiana Jones exhibit first. Upon entering the exhibit you are given a tablet with headphones (included in the price of the ticket). The tablet was the size of a Nexus 7 and each exhibit had a three digit number that you could enter to listen to additional information as well as watch additional content on your tablet. Everyone was given the tablet and it would be hard to experience the exhibit without it. An additional benefit was the fact that it was nearly silent as you walked through the exhibit because people rarely talked to each other and you had your headphones on. The exhibit was a mix of "how did they do that on the Indiana Jones movies" and some description of archaeology on a global scale. There were a lot of movie props - the golden idol that Indiana Jones has to quickly swap with a bag of sand, the clothes that some of the actors were wearing, etc. I remember the first Indiana Jones the most and although I think I saw all four of them I didn't remember a lot about the plots of the last three. The exhibit did have a section on how photography played an important role in the early archaeological finds to document the finding and artifacts from a variety of sites in South America and Egypt were included. Overall I found the exhibit interesting but not something that I would probably strongly urge someone to visit for $15 unless they were a movie buff who also liked archaeology. I went through the archaeology exhibit in roughly an hour. I didn't listen to every accompanying video but the information desk said if you listened to every recording it would take about 90 minutes to complete. I did also go through the Monster Fish exhibit which I thought was well done with a mixture of video, life size replicates of huge freshwater fish and some interactive displays for families and children. I walked through in about 20 minutes but could have spent more time if I wished. On my return to Mount Vernon I decided to stop at the Smithsonian Air and Space Museum on the Mall. 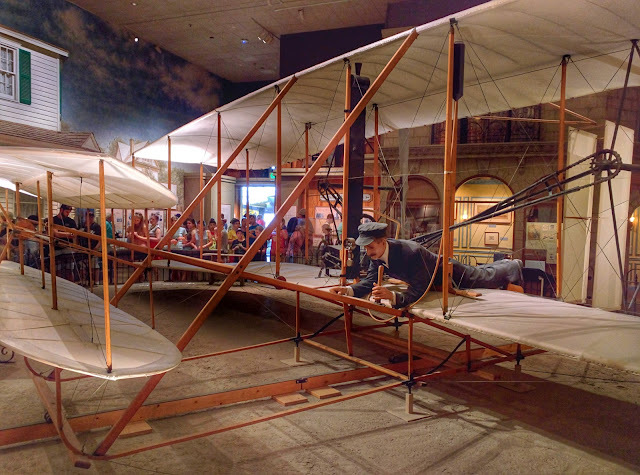 I knew it would be crazy busy but I had a very specific goal in mind for the visit - seeing the exhibit on the Wright Brothers and the 1903 Wright Flyer. After recently finishing, and greatly enjoying, David McCullough's new book "The Wright Brothers", I knew I had to stop by and see it with a new perspective. It was very enjoyable to walk through the exhibit and see many of the things mentioned in the book. The exhibit really helped me come full circle with the experience. Later during my stay in the DC area for the fellowship I hope to take some time to visit the other Smithsonian Air and Space Museum - Udvar-Hazy Center - out near Dulles Airport. It isn't easy to get to - a mix of the Metro and buses - but I have wanted to see it for years and never taken the time to do it. They also have some Wright material that I would like to see. Overall a fun day visiting some specific exhibits that I wanted to see in DC. Tomorrow the plan is to spend some more time at the library, maybe sit in on a couple of lectures and perhaps spend some time at the education center on the grounds at Mount Vernon. It really is sort of like Christmas right now with all this time to explore, think, write and take pictures.